Photograph collection of webmaster 25251 at Springs Branch, date unknown. The nineteen year career of D7601/25251 started with eight months on the Eastern Region, then a year on the Scottish Region, before transfer to the LMR for the remainder of its career. Time between last Classified repair and withdrawal: 52 months. Time between withdrawal & scrapping: 22 months. October 1966 to Eastfield (on loan). September 1967 to London Midland Midland Lines (LMML). May 1970 to Liverpool Division (D08). October 1971 to Manchester Division (D09). March 1973 to Liverpool Division (D08). 25251 was the 229th Class 25 to be withdrawn. After withdrawal and storage at Crewe, 25251, 25284 & 25327 moved to Swindon between March 26th & April 2nd 1985, with 25251 being scrapped by the middle of November 1986. The cabs were shipped to Vic Berry's, Leicester for final disposal. Noted Derby Works June 1969 (General Repair). Noted Derby Works October 1972. Noted Crewe Works June & August 1974 (Classified). Noted Derby Works June to September 1980 (General Repair). Noted Derby Works March 1984 (N4 repairs). The Scottish Region swapped D7598 - 7601/11/12 for D7576 - 79/81/83/84, the latter being boiler equipped, allowing them to replace the ailing NBL types on the Glasgow - Dundee run. During the first week of July 7601 was active on the Scottish Region. On July 1st it worked the 12.05 Euston - Perth forward from Mossend Yard to Perth. On July 7th 7601 & 5149 worked the Newcastle - Stranraer Harbour and the next day's 13.30 Stranraer Harbour - Newcastle. The last day of 1969 saw a couple of Class 25s called out to work those duties that they seemed so familiar with, but were of such a non-routine nature. AM10 071 working the 10.43 Coventry - Euston service collided with some empty derailed wagons near Roade. The leading coach M76155 was severely damaged in the collision. For the clean up Rugby sent out a wiring train led by 5239 whilst 7601 arrived with the Bletchley crane. Three Coventry locals, targets 38,39 & 42 required dual braked locomotives, in this case Class 25’s, since Bescot only had two at this time (7601 & 7626), this diagram was somewhat difficult to maintain! These matters were not helped by locomotives being borrowed from time to time. Condition July: two-tone green livery with full yellow cab fronts, no blanking plates, hand/footholds plated over, engine exhaust located above engine room, straight sided sandboxes, three-rung bogie mounted footsteps, 'D' prefix present. (Presumably the green livery was lost when repainted at Crewe Works during the summer of 1974). On June 15th a Burton on Trent - Skegness day excursion was worked roundtrip by 25251 & 25256. Present at Nuneaton stabling point on September 7th were Class 25 Nos. 25076, 25251 & 25258. Severe gales on the evening of January 2nd affected much of the country with wind speeds consistently above 50mph. These high winds brought down the wires in the Berkswell area, a diesel multiple unit shuttle substituting between Coventry and Birmingham. 25251 & 25277 assisted 87023 with an empty coaching stock working through the affected area on the morning of 3rd, later returning to Coventry via Nuneaton, whilst 25236 arrived with a re-wiring train, though full service was not restored until January 4th. On October 24th 25251 & 25316 were noted at Nuneaton with the northbound Fletliner. The detailed reporting available from the TOPS computer system as well as keeping track of locomotive movements allowed a detailed look at works shopping and maintenance histories. 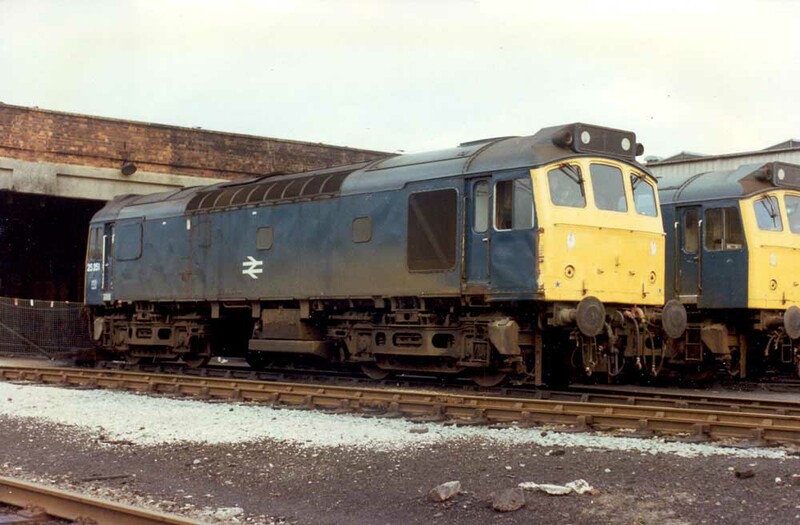 As 1979 closed eight Class 25s were overdue for either intermediate or general overhaul. The most delinquent was 25092 which had been scheduled for an intermediate repair in December 1978. Only 25251 was overdue for a general repair, scheduled for December 1979, but which actually took place six momths later! In early November the BR/LT diesel multiple unit service north of Rickmansworth suffered from leaf-fall as the line climbed through the Chilterns. A number of Class 25s, including 25313 (4th) and 25251 (6th) were used to assist northbound diesel multiple units, the commuter service being considerably disrupted. Engineering work on March 29th saw the 00.15 Birmingham New Street - Euston assisted between Rugby & Bletchley by 25251 due to the power being off. On May 7th the 16.07 Derby - St. Pancras was worked to Leicester by 25251. Daily from June 22nd to June 26th 25251 & 25143 worked various motorail services between Kensington Olympia & Willesden. On July 4th a David Bowie concert led to the running of a relief 23.00 Birmingham International - Euston which was worked by 25251 & 25248. On July 12th 25251 & 25285 worked a Northampton - Margate day excursion to/from Mitre Bridge Junction. On July 18th the 10.10 Euston - Aberystwyth from Birmingham New Street and the 18.00 Aberystwyth - Wolverhampton were worked by 25251 & 25235. The next day (19th) the same pair worked the 08.45 Birmingham New Street - Aberystwyth and the 18.00 Aberystwyth - Euston to Nuneaton. On August 4th a Maryport - Llandudno Town day excursion was worked round trip by 25251 & 25296, for a total of 468 passenger miles. The 10.05 Manchester Victoria - Glasgow Central was worked to Preston by 25251 on September 19th. On November 22nd 25251 was noted at Coventry on permanent way duties with five other Class 25s, whilst on December 11th 25251 & 25254 worked the Leith - Heysham pipes. 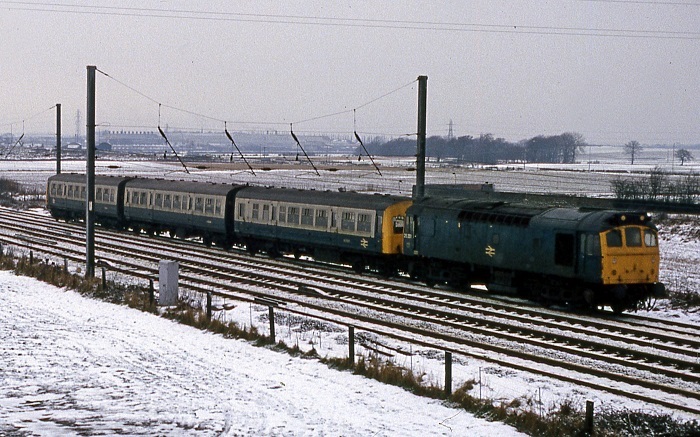 Photograph collection of webmaster 25251 passes Winwick Junction on December 21st 1981 with a diesel multiple unit. Passenger workings during 1982 commenced on April 1st with 25251 assisting the 14.55 Bournemouth - Liverpool from Banbury to Birmingham New Street following the failure of 47121. Photograph courtesy Roger Geach 25251 passes Ayres End, Harpenden with a Nottingham - St Pancras van train on April 21st 1982. On May 26th the electric locomotive hauling the 13.18 Birmingham New Street - Euston failed at Tile Hill, 25251 dragged everything the short distance to Coventry. The 10.10 Euston - Aberystwyth from Birmingham New Street and the return 16.05 Aberystwyth - Shrewsbury were worked by 25251 & 25265 on June 5th. The next day (6th) the same pair worked the 08.45 Birmingham New Street - Aberystwyth from Shrewsbury, the 16.40 Aberystwyth - Machynlleth, the 17.25 Machynlleth - Aberystwyth and the 18.15 Aberystwyth - Euston to Shrewsbury. 25251 & 25265 were still together the following weekend (June 12th) and worked the 07.38 Shrewsbury - Aberystwyth and the 10.07 Aberystwyth - Euston to Wolverhampton. On August 29th the power was off for engineering work, the 00.27 Manchester Piccadilly - Euston was assisted between Bletchley & Watford Junction by 25251 & 25298 whilst the 01.00 Holyhead - Euston was assisted between Watford Junction & Willesden by 25251 & 25256. During the second week of September, on 7th 25251 handled the 19.50 Crewe - Lincoln Central as far as Derby due to a diesel multiple unit failure, whilst on 11th 25251 & 25219 paid a visit to Aberystwyth working the ex 10.10am from Euston forward from Birmingham New Street, returning with the 16.05 Aberystwyth - Shrewsbury. Finally on 19th 25251 worked the 10.05 Manchester Victoria - Preston, being a portion for the 09.09 Liverpool - Glasgow. 25251 was noted at Speke on April 3rd. 25251 & 25296 were noted passing through Manchester Victoria on April 6th with an eastbound cement train. 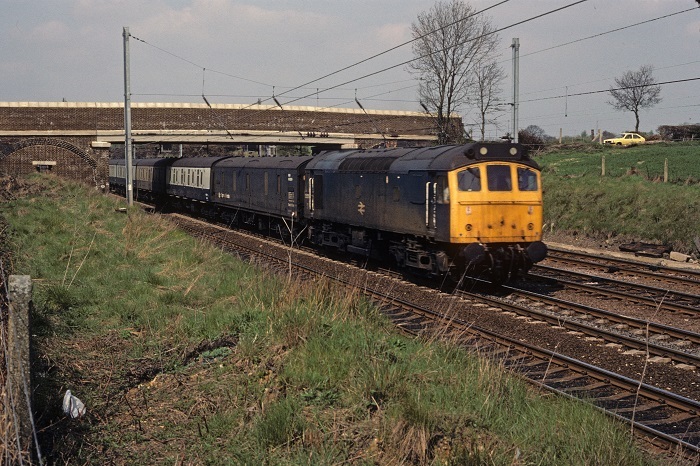 On May 10th 25251 was noted eastbound at Horbury Station Junction with a lengthy mixed freight. On June 11th the 08.35 Euston - Blackpool North was worked from Preston by 25251. On June 18th the 08.30 Glasgow Central - Blackpool North and the return 14.40 Blackpool North - Glasgow Central saw the roundtrip Preston - Blackpool North portion worked by 25251. The 07.44 Shrewsbury - Aberystwyth and the return 10.10 Aberystwyth - Euston to Wolverhampton were worked by 25251 & 25287 on July 30th. The next day (31st) the 10.00 Euston - Wolverhampton was assisted by 25251 & 25287 between Bletchley & Rugby due to the power being off for engineering work. August & September produced no recorded passenger workings but on October 8th 25251 worked the relief 09.00 Manchester Victoria - Glasgow Central as far as Carlisle. This must have been a grand sight as it worked up the Lune Gorge and over Shap. And to close the year out serious trouble at the south end of the WCML on December 20th & 21st saw many diesels called in, including 25251 to assist the electric services whilst the power was off. These workings included the 20th's 07.46 Northampton - Euston with 25287 and the 20th's 18.10 Euston - Rugby by itself in addition to several shorter assists. 25251 & 25306 were noted on the night of February 10th with an overnight postal service at Birmingham New Street. On February 18th 25251 was noted at Chester with a parcels working. On February 25th 25251 was noted in Crewe station with an unidentified Class 25. On April 6th 25251 was noted in Luton yard with a mixed freight and with the same freight at Willesden. 25251 was stabled at Saltley on April 28th. 25258 & 25251 were noted northbound through Crewe on May 31st with loaded sand wagons, possibly the Oakamoor - St Helens turn. 25251 was stabled at Cockshute on June 2nd. 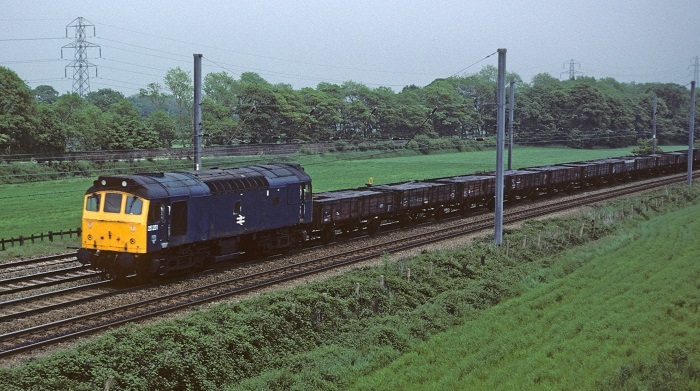 Photograph courtesy Roger Geach 25251 passes Winwick Quay on June 5th 1984 with a load of sleepers. 25251 & 25058 worked a late afternoon Tees Yard - Bescot freight on July 5th. On July 14th the 23.05 Manchester Piccadilly - Gatwick Airport was assisted between Rugby & Northampton by 25251 due to the failure of the electric locomotive. A Derby - Aberystwyth day excursion on July 26th was worked roundtrip between Wolverhampton & Aberystwyth by 25251 & 25282, 45056 handled the roundtrip Derby - Wolverhampton portion. Two days later (18th) 25251 & 25282 were diagrammed to work the 07.44 Shrewsbury - Aberystwyth, but 25251 failed at Machynlleth and was removed. On August 25th the relief 03.55 Crewe - Stoke-on-Trent with 86247 was dragged by 25251. A Kilmarnock - Blackpool North day excursion on September 14th was worked forward from Preston by 25251. On September 30th the 09.40 Euston - Glasgow Central was assisted between Stockport & Manchester Victoria by 25251, which failed at Manchester Victoria, 40015 dragged everything to Preston. On December 6th 25251 was in the Birkenhead area and worked the 6M90 Whitemoor down to Duke Street with 31325 (from Duke Street the Class 31 would run light to Guide Bridge), then used for Target 10 (Birkenhead ballast trip) to take a crane from Tuebrook Sidings in Liverpool to Dee Marsh. 25251 was withdrawn on January 16th 1985. A cabside number panel of 25251 was saved from scrapping. No.1 end, 2nd man's side: three dents at least by April 1983, may have been touched up by April 1984. Page added January 14th 2013.